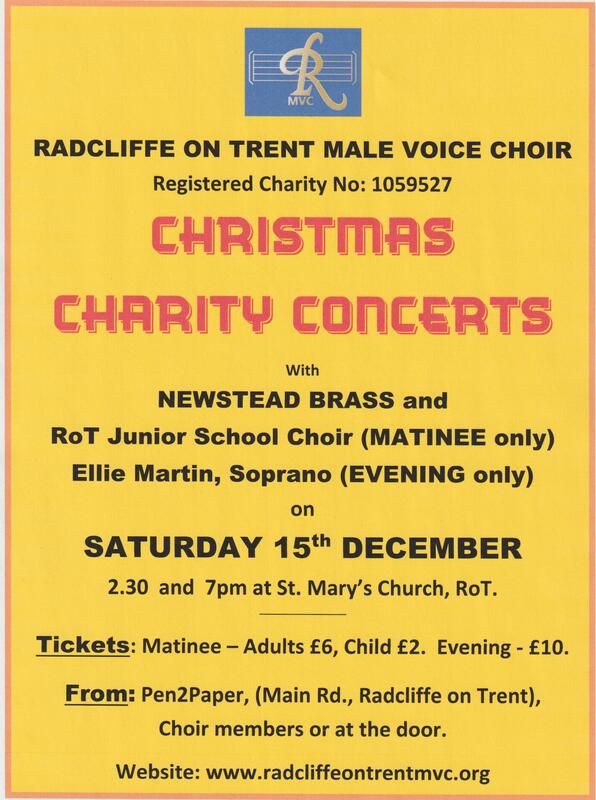 Our home base is the village of Radcliffe on Trent in Nottinghamshire. 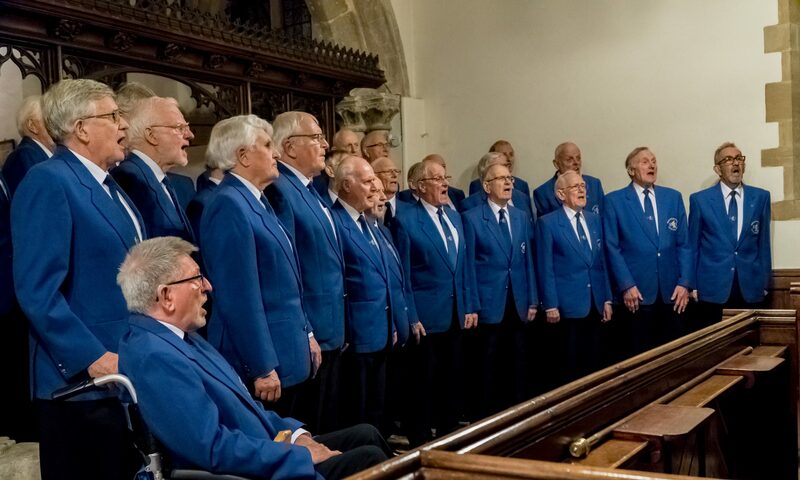 The Choir was formed in 1983, has sung over 500 Concerts and raised over £400,000 for charity, performing in varied locations including Westminster Hall, The Albert Hall, The Cutty Sark in Greenwich, Belvoir Castle, village halls, 20 different cathedrals and churches. Internationally, the choir has performed in Belgium, Germany, Italy, France and Wales. We have also exchanged visits with a South African Choir. 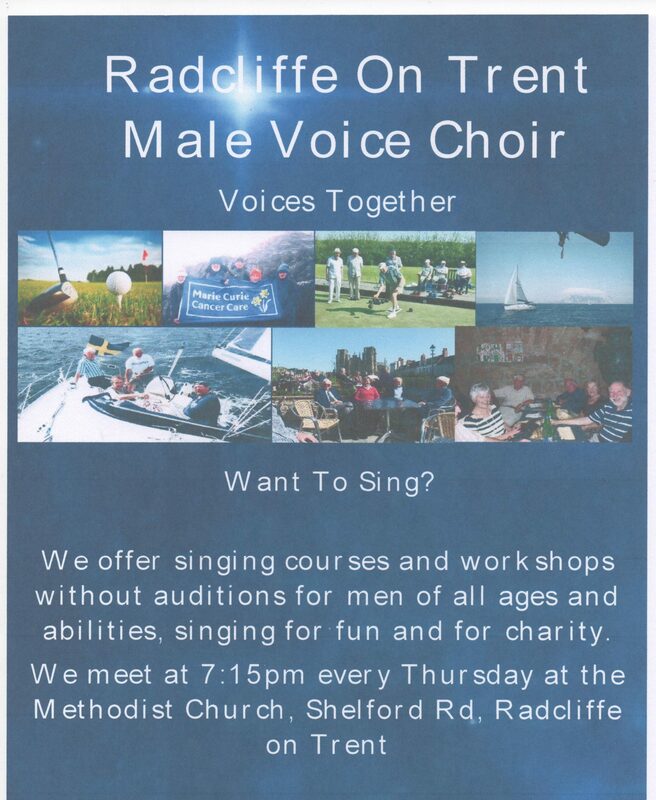 For the latest information on the Radcliffe Male Voice Choir please visit other pages of this website (www.radcliffeontrentmvc.org). Also a Facebook Page has now been launched at www.facebook.com/ROTMVC. Sat. 19.00 May 11th. Joint Concert w Phoenix Choir at Christ Church, Grantham. Afterglow at Great Gonnerby Social Club. 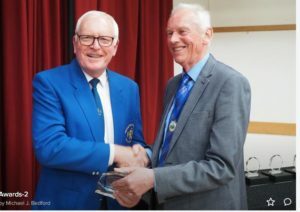 Appearance at RoT Parish Council AGM to receive the Chairman’s award for services to the Community. 1300 5th April – RECITAL IN GLOUCESTER CATHEDRAL. 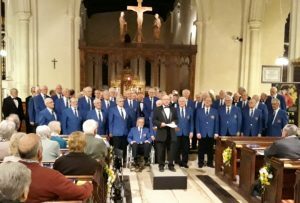 1200 6th April – Concert at St Georges Parish Church, Upper Cam. 1930 6th April – Joint Concert with Cirencester MVC at Cirencester Baptist Church. 1115 10th April – Recital in Grange Hall, RoT, in support of the Blue Bird “help for aged” initiative. in order to mark the completion of our 8 week singing course (which had started on 10th January 2019 and has attracted ten new members), we, together with the course participants, held a “Mini” CONCERT on Thursday 7th March at 8.00 pm at the Methodist Church, Shelford Rd., RoT, for partners and friends at which 10 numbers were sung, 5 of which were learnt during the course. This was an enjoyable event which, incidentally, also raised £386 for Prostate Cancer Charities. In early November 2018 we were proudly part of 2 events commemorating the end of WW1. 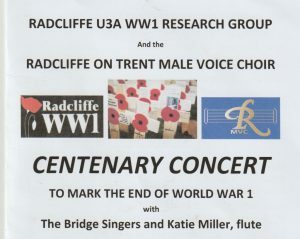 These were, on Saturday Nov 3rd, a concert at All Saints Church, Cotgrave for the local British Legion Poppy appeal; and on Thursday Nov 8th, at St Mary’s Radcliffe on Trent in support of RoTs U3A exhibition illustrating the effects of WW1 on this village. Our first Concert of the 2018/19 season was held at St Peters, Ravenshead, on Saturday 20th October where a full house clearly appreciated the efforts of both ourselves and those of a young lady Soloist, who graciously stepped in after a late cancellation of the scheduled Soloist, and what a performance she gave. Remember the name, Becky Birch, a stunning singer originally born on the Canadian estate in Radcliffe, who reached the final of the OpenMic competition when only 17. She studied an intensive drama course in musical theatre to prepare for Mansfield’s Funky Studios Performing Arts School, graduating this year. Becky gave us a variety of soul, jazz, swing and contemporary numbers from Sam Smith, Caro Emerald, Marvin Gaye, Elvis (! ),the great Etta James and from the musical Hairspray. As you listen, you can hear echoes of the great female singers, yet her style and voice is uniquely her own. If you get chance, hear her soon, as she is auditioning for drama schools in 2019 to realise her dream to perform. 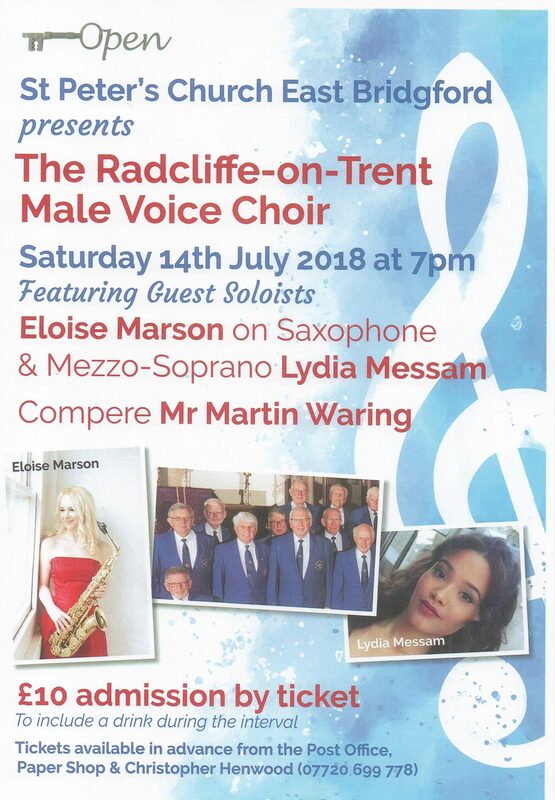 It was a perfect summer’s evening at St. Peter’s Church in East Bridgford when the Radcliffe on Trent Male Voice Choir gave a tremendous performance with two outstanding local East Bridgford soloists, Eloise Marson (saxophonist) and Lydia Messam (soprano). The evening raised over £1,000 for the church and local charities. Ably supporting the performers were accompanists David Beer, Stefan Reid and Ron Berry. With fine music, the sunshine and a glass of wine, everyone had a fantastic evening. 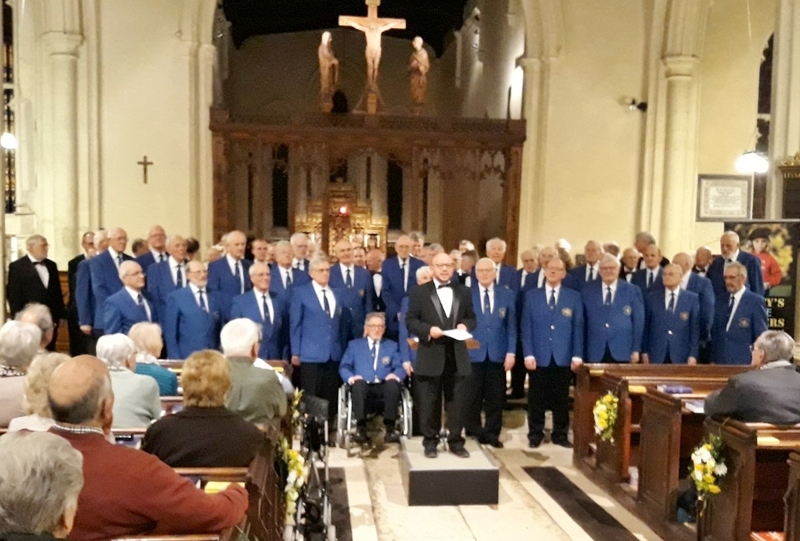 Previously, on June 16th we were joined by the Romsey MVC, on tour from Hampshire, in a joint event held at St Mary’s RoT, entitled “Voices in Concert”, (music for an early summer evening). Concert report: The Radcliffe on Trent Male Voice Choir were delighted to welcome their special guests, the Romsey Male Voice Choir, under the spirited direction of their Musical Director Marion Maxey, a ‘Classic FM Teacher of The Year’ finalist, and their accompanist Richard Stannard, formerly the highly regarded Head of Music at Thornden School in Chandlers Ford. 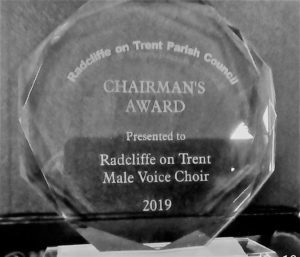 As usual, the Radcliffe on Trent choir were under the direction of Dr Michael Bonshor and their celebrated accompanist, Eleonara Babitsky. Both choirs performed individual sets and joined together for two sets of operatic, devotional and show tunes, and the combined effect of both choirs was tremendous, filling the church with a glorious and harmonious sound. The combined choir was certainly more than the sum of its parts. 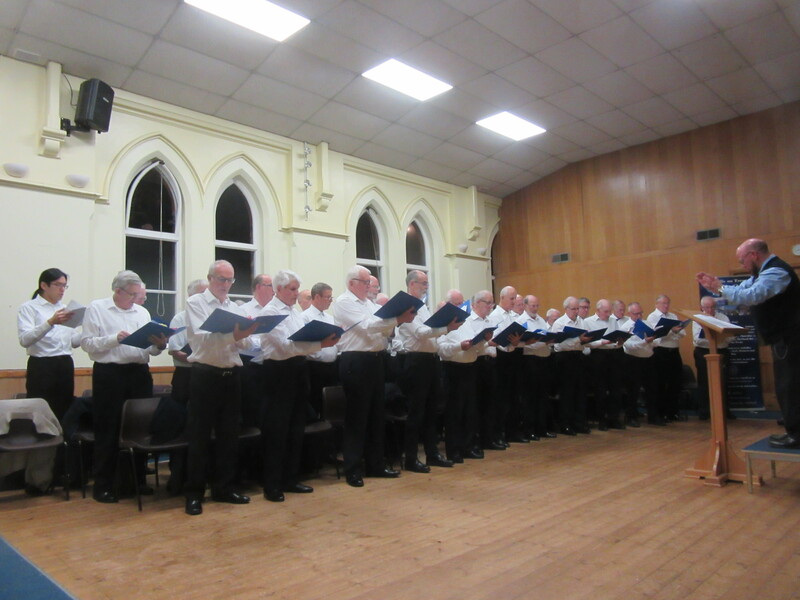 There was also a distinctly nautical flavour during the evening with Radcliffe singing of the pirate life and Romsey singing of drunken sailors. Romsey also showed off their linguistic skills with songs in Welsh, Maori and Vietnamese and both choirs showcased their appreciation of Musicals. Earlier in June, on the 2nd, at Epworth, Lincolnshire, we sang at St Andrews Church where Samuel, the Father of John and Charles Wesley, was a former incumbent. 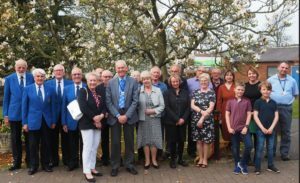 On this occasion the Choir sang a spirited selection of numbers as guests of the Epworth choristers, The Isle Singers, a mixed Choir who sang a mixed programme of devotional music. This church has impressive acoustics and the twelve Isle Singers were able to fill the church with a clear, enchanting and spiritual sound. 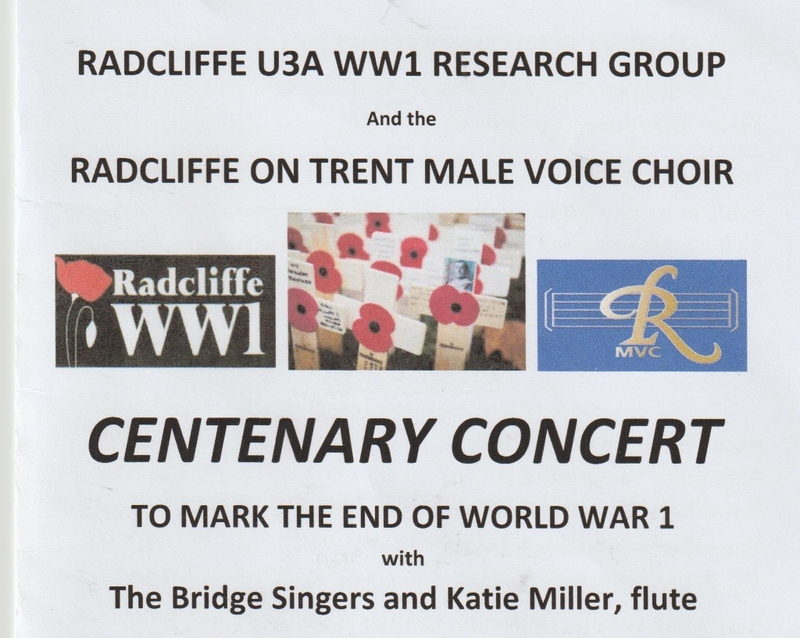 The Radcliffe choir varied their programme between show numbers, spirituals and American songs from their extensive repertoire. 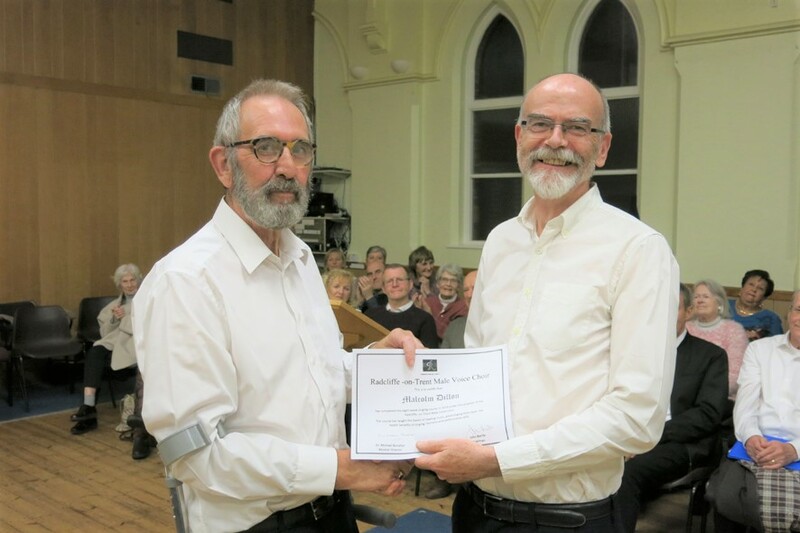 The evening was able to raise over £600 to put towards the organ restoration fund, this instrument being used to great effect during the concert. 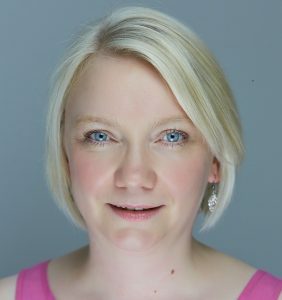 Two weeks previously (19th May) we had sung at Whatton with Soloist Carolyn Sharpe. The choir performed their varied programme to a an enthusiastic audience in the beautiful and historic church of St John of Beverley in the delightful setting of Whatton, a small village along the A52. The church is associated with Thomas Cranmer who came from nearby Aslockton and has a William Morris window. One of the high points of the concert was the performance of Caroline Sharpe accompanied by Nest Harris. Her exquisite voice drew admiration from audience and choir alike. Her repertoire included the Ivor Novello pieces Waltz of My Heart and My Dearest Dear, the jazz number Cry Me A River, and opera pieces Adele’s Laughing Song from Die Fledermaus and the well-known O Mio Babbino Caro, amongst others. It’s no wonder that she won the Mario Lanza Opera prize in 2009. (Bill Hill, Media Officer). Earlier in the year was our WEEKEND SPRING TOUR when we sang in ELY Cathedral at on 6th April, and with the Huntingdon MVC , in a joint concert on Sat. 7th April. The latter venue being St Mary’s Church in Godmanchester. 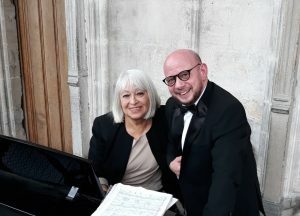 ( The photos are of , top, Eleonora and Michael, accompanist and maestro, below, the Godmanchester event).